NCMGMA’s Annual Conference is set for May 8-10 in Wilmington and we are looking for presenters who can speak on an assortment of leadership and management topics. We received such positive reviews from our Fall Conference Peer-to-Peer sessions we’re looking to continue these short-sessions in 2019 in Wilmington. Please see the list of educational focus areas below. If interested, you can email Melissa@ncmgm.org and provide your topic, a short session description and the time frame you are able to present (15 or 30 minutes). Please let us know of your interest by December 30, 2018. Again, please let us know prior to December 30th of your interest in presenting by sending an email to Melissa@ncmgm.org with the topic, session description and also the time-frame you’d be able to present in (15 or 30 minutes). 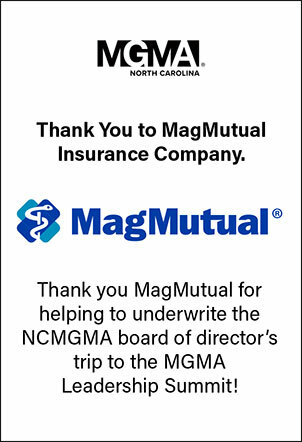 Once submission closes, your information will be reviewed by the NCMGMA Conference Committee. All interested parties will be contacted no later than January 31st.